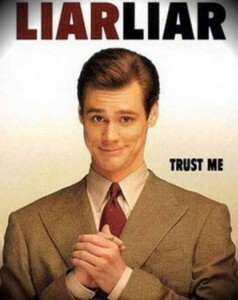 The habit of lying that is formed in the childhood, in adulthood may decrease (with the reduction of the authoritarian pressure from the outside) or increase (apart from the authoritarian pressure of the parents, for example, pressure from a husband / wife is added), but it does not disappear. There is a logical question about the possible transfer of the habit of lying in everyday life in the sphere of professional activity of a person. The subject of the distortion of facts and information was studied by the well-known scholars: Z. Freud, J. Maritten, A. Camus, B. Russell, M. Foucault, A. Gramsci, A. Toynbee, K. Jaspers, specific research and tests were performed by G. Marcuse, R. Bart, K. Mannheim, E. Durkheim, J.-P. Sartre, E. Junger, V.-A. Adorno, K. Apelia, M. Blanche, D. Bonhoeffer. R. Feldman and his colleagues discovered that unforced lying is normal behavior of 60% of respondents. According to scientists, “people are constantly lying without special need for it, but lies became a natural part of everyday life.” V. Talwar (McGill) and Kang Lee (U.T. Toronto) confirmed that parents influence of behavior of their children, contribute to the development of the instinct of self protection, provoke distortion of the facts. Their experiment shown that the same type of authoritarian education a person to lying even in childhood. The more severe are the conditions, the more and more often the child turns to lies, covering his own mistakes. Over time, this style of behavior becomes a habit and affects the outlook, life in general and relationships with others. Despite the negative side of deception, there is a theory that a lie can carry a positive goal. J. Sarzynska (Higher School of Public Psychology in Warsaw) came to the conclusion that the basis of a lie is fear to look impolite, not ideal, and also because of the desire to mitigate the inconvenience to others. An American scientist N. Ruddy (Washington DC) argues that there are people who enjoy the deception process, even if there is no direct benefit: as a result of a survey conducted in the USA and the UK with respondents of 20-30 years old, it was discovered that those who wrote off or spied spoke about the “adrenaline” feeling and adventurism, which in turn contributed to vivacity, in contrast to those who did everything honestly. But the area of the transfer of the daily habit of lying to professional activity is still insufficiently researched. The aim of the study is to analyze the factors of extrapolation of the habit of lying in everyday life on the professional sphere of human realization. Methods and materials of the research: analytical method (processed arrays of previous researches), pilot survey (students of the first year of studying of the O.O. Bogomolets NMU) search activity (revealing of causes, consequences and method of formation of the problem), systematic (revealing tendencies and factors of deception). The first thing that our research attention 136 calls for is the number of terms that people (Ukrainians) denote aspects of lies – they are the same, but with shades and nuances. The results obtained. The symbiosis of lies is the creation of illusions, the deception of oneself, the false improvement of personal qualities and actions throughout life. Lots of lies – the usual, random, rude false, simple concealing that the environment uses without noticing it. Reflex of lies – automatic action lies on a subconscious level without thinking or controlling this act. Fault – distortion, ornamentation or even oppression of a situation, act, personality or fact. It is not true – a false statement that intends or may arise as a result of a lack of information, knowledge, understanding or fear. Oman – Illusion, fiction or escape from reality (truth) is formed. Deception – an act under the influence of certain factors. We classified the lie and formed the data of the varieties: 1.) “White Lie” (according to P. Ekman) – an easy lie, which brings benefits to anyone and does not foresee serious consequences. 2.) Ritual (game). 3.) Practical. 4) Individual. 5.) Global. 6.) Combined lie is the influence of several provocative aspects of lies that have a common purpose. For every person, the notion of the truth is different, it all depends on what purpose it carries in itself, from which side to look at non-truth, and how a person perceives this action. In our study, under the notion of “lie”, we will understand the verbal distortion of reality, to which person is provoked by certain processes of its perception, which can carry both positive and negative consequences. Also, there is such a kind of truth as combined lie. We also need to divide the conscious lie and the unconscious (by habit, or impulsive (from fear, anger or disturbance). After conducting a survey and research on this topic, we have identified four main factors of the provocation of a lie: 1.) Fear of reaction to the truth 1.1 Fear of offending the interlocutor – 26% 1.2 An attempt to avoid aggressive consequences – 20% 2.) For personal gain – 15% 3.) Complex: to be convicted of society (to look better in the eyes of others) – 39%. In this case, a person acts under the influence of several aspects that interact and complement each other in order to achieve one goal. Example: the child broke the glass and hides the truth from his parents (in this case, the aspect (1 (1.2)) and 3) works. We conducted a survey of employees of different statuses (junior worker, chief, employer). We found that the type of lie in professional activity varies according to the status of a person. At the initial stage, younger employees are supposed to use practical White lie, which allegedly can not carry serious consequences. Most often, the reason for such a lie is factor 1.2 (and fear of being convicted by their boss or escape from personal responsibility, laziness, etc.). In most cases, such a White lie may be the concealment of minor errors in the rough accounts, assurances of non-executed, seemingly unimportant cases executed. But on the other hand, the cause of a light lie can be a good intention on the basis of which there may be an attempt to protect the person, the negative impact of this situation on its subsequent destiny due to an accident, etc. In the next stage, after the justifications of the junior employees, the chief verified and the amount of white lie is supposed to be a global type of lie before the employer realizes it or not. At the last stage, a lie may in some 137 way affect both the destiny of employees of different statuses, the chance of the enterprise, the institution or the general professional sector. It was found out that in today’s life the lie fully embraced the sphere of human interaction with others, our perception of the world around us, our society and ourselves as a person and widely influences professional activity. It should be understood that any missed trifle or fleeting lie can not only harm others, but also personality that can be considered as an editor of a lie. With every little “White Lie” person is increasingly deepening into the infinite world of lies, but later he does not notice when he lied. Most people do not really understand what, but how they provoked them to such an act. Possibly perception of the truth as a way to compromise or the desire not to offend anybody. On the one hand, a lie can help us in personal affairs, preserve relationships and even the health of loved ones. As a rule, “unspoken” is a sign of courtesy, and sometimes it should be kept silent rather than disturbing someone, but it will not be at the same time an abuse of someone else’s attitude and trust. Or just under the influence of fear, we automatically resort to lies, as to personal protection, without negative intentions. This entry was posted in Social on 02/08/2018 by Mary.